This is the best recipe to bring to a summer party (Memorial Day, Fourth of July, or Labor Day) because it requires no cooking and is super simple to prepare. Like my famous salmon recipe, people chase me down for the recipe after tasting it. 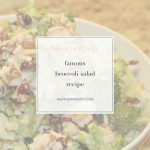 This isn't a strictly keto friendly recipe because of the dried fruit which contains natural sugars. If your eating low carb, get dried fruit with no added sugar. 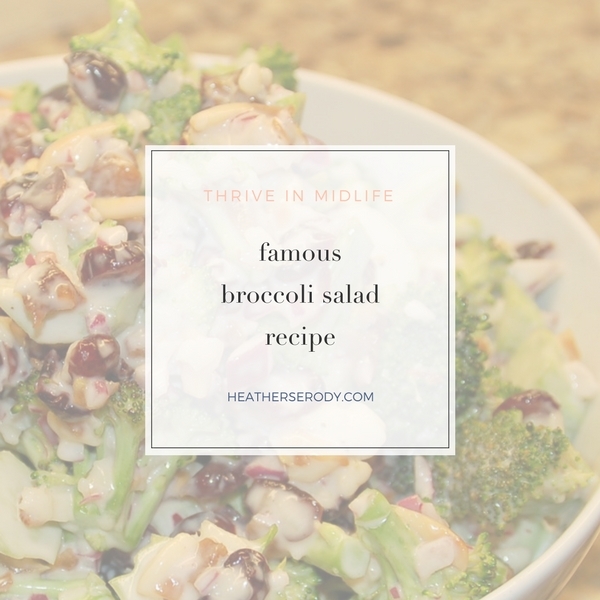 I like to make it several hours or up to a day in advance to allow the broccoli to take in all of the wonderful flavors of the marinade. Seriously, there are so many good bits in this salad: walnuts, cranberries, diced apricots, shredded sharp cheddar cheese, and almonds that you won't be able to stop eating it. If you want to make it vegan just substitute your favorite vegan cheese shreds (like Daiya) for the cheddar and make a batch of my awesome homemade keto mayonnaise. Either way? Delicious. Basically, you can just customize this recipe to your own tastes and preferences – you just can't go wrong. Enjoy! Peel stalks with a vegetable peeler and chop into 1/2" disks. In a separate bowl, whisk mayo together with honey, vinegar, salt, and pepper. Dice apricots and onion and grate the cheese. Add to mayo mixture. In a small fry pan, toast almonds over medium-heat until just browned. Add mayo mixture and almonds to broccoli and mix well. Serve immediately or make ahead and chill one day prior to eating. A special thank-you to my dear friend Carolann for graciously sharing this recipe with me.